In the early morning of Sunday, October 21th, 2018, a group of activists once again occupied and thus blocked a digger in the coal mine. 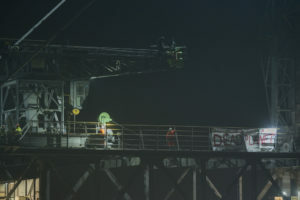 The activists climbed up peacefully and attached banners saying “No jobs on a dead planet”, emphasizing once more that the action is directed against the coal mine and not against the workers. The folks wanted to raise awareness about the fact that a temporary stop to deforestation does not put an end to the destructive coal mining. Still nature is being destroyed, villages demolished, people being forced to relocate and whole regions of land being devastated for the generations to come. While they are continuously hiding behind practical constraints of public concern, coal extraction is continued for private interests only. Ignoring long term expenses makes lignite mining lucrative – but only for a few. 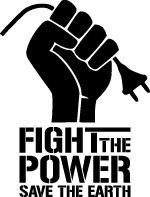 It is technically unnecessary to the energy supply, the most destructive climate wise and just has no future. 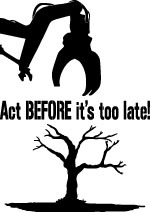 The continuous cutting of jobs has been planned for years by RWE and is no way connected to the occupiers. 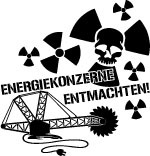 On the contrary actions and the Hambach Forest resistance have created lots of jobs. In the security sector. In the long run it is impossible to maintain the ignite mining jobs. Instead, we need climate friendly alternatives or should work towards a society based on solidarity. 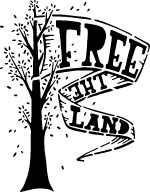 This emancipatory idea opposed to the currently dominant dogma of maximizing profit and the escalating demand for total control has been implemented in the every day life in the Hambach Forest for years, while being violently suppressed by the state and corporations. 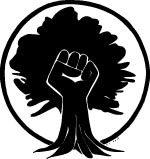 But they didn`t succeed – every eviction has made the resistance grow and has empowered folks to develop and experience concepts of living together based on solidarity. It is in the responsibility of each and everyone of us to take action ourselves, be it occupying a digger, building tree houses or washing the dishes in the camp – together we can achieve something!